To create this signature cold plate, we cook the specially selected farm chicken in low heat, and then soak it in Chinese wine base with condiments until it is totally infused with the flavor. Our crispy appetizer, so tasty our patrons can’t stop eating it, uses only the freshest eels in the market. They are deep-fried then tossed with our exclusive caramel sauce. 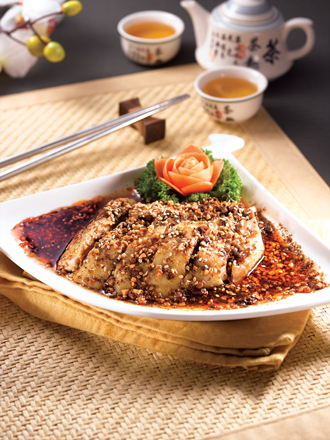 This “Chilled Spicy” chicken, after careful cooking with special spices, is then served with a special Szechuan style sauce. Its seductive flavor makes your mouth water before you even begin eating! The selection of ingredients for this dish is unique. Two pieces of specially-raised farm chicken leg meat, wing meat and breast meat are double-boiled with ginger and scallions for six hours. The resulting soup is delicious, sweet yet mellow, and totally unsurpassable. The La Mian, hand-pulled by Chefs from Lanzhou, China, are made with top flour from Canada. They can create 1800 finely-crafted noodles in one minute. Our Shanghainese deep-fried pork ribs are prepared in a non-greasy way to ensure a crunchy exterior with tender meat inside which can be used to soak up the rich soup with springy La Mian or eaten separately. This noodles are sliced with handheld knife, resulting in a texture which is different from our famous La Mian. 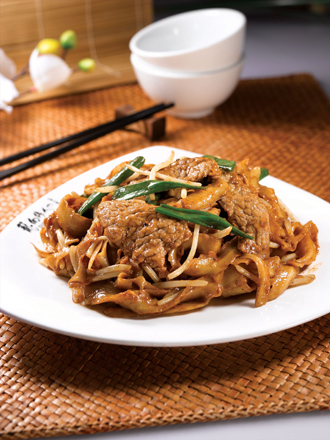 The noodles are stir-fried with fragrant, spicy Black Pepper Beef or Seafood. This is a dish not to be missed. 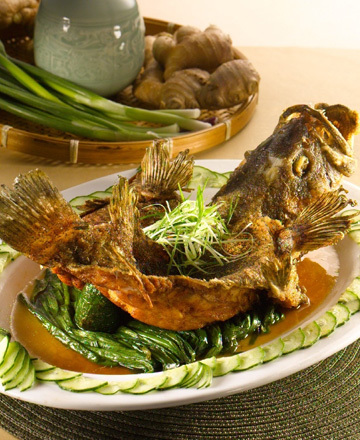 Fresh Garoupa from Pantai Remis is deep-fried, then grilled to maintain its succulent texture. It is then served with a hot spring onion oil and special sauce. 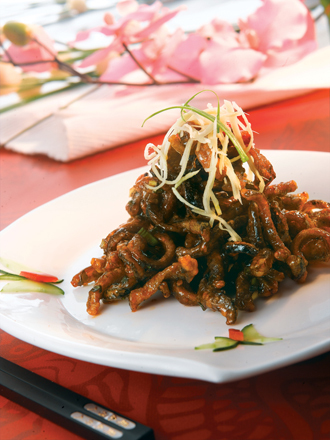 The sea cucumber has always been an essential tonic supplement to the Chinese, it is rich in protein and full of nutrients. 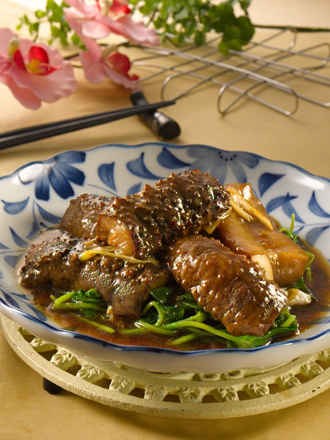 Finest South American sea cucumber is braised Shangainese style, producing a fresh, chewy texture. 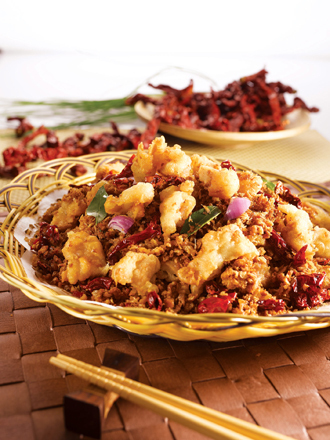 This Szechuan delicacy is based on extensive use of Chinese pepper, chili padi and dried chili. Tender chicken thighs are deboned and cut into cubes, marinated then sautéed with chili oil. As a final touch, the dish is tossed with Chinese peppers, chili padi and dried chilies to achieve that distinctive hot, spicy taste. 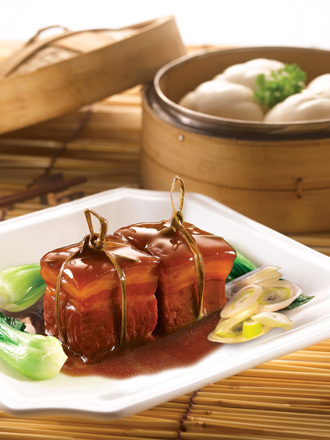 Braised Shanghainese Pork Belly with Lotus Leaves is a childhood dream dish for many. 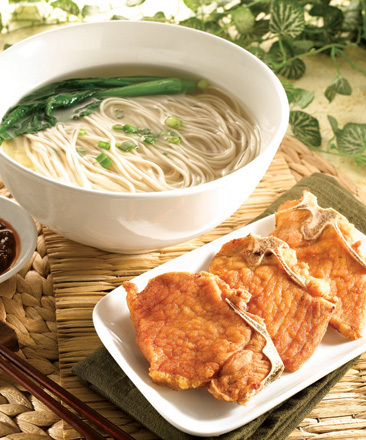 Hexiang hemp string is used to tie the non-greasy pork belly which is then cooked under firewood, an ancient healthy cooking method that results in a delicious aroma and succulent, tender meat. This tasty dish is topped with a unique gravy specially created by our chefs. 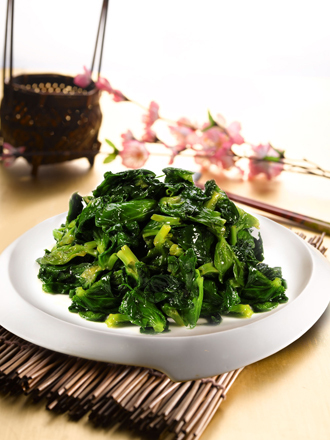 Pea sprouts (Dou Miao) are a simple yet luxurious vegetable, as only the tips are used, making it extra precious. Dragon-i pea sprouts are grown in Indonesia, in Highlands 3,000 m above sea level. Every week, they are air-flown in, after which they are carefully selected by our staff to meet our stiff requirement; only the top 3-4 inches of the sprout tip will be picked. Simple stir-frying results in an elegant dish full of aromatic flavor. 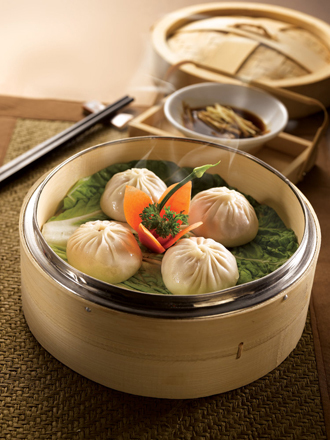 The crystal pagoda-shaped XIAO LONG BAO (Shanghainese Steamed Meat Dumplings) originated from Shanghai’s Nanxiang Town. Every steamed specialty dumpling is skillfully handmade, each displaying at least 18 delicate folds. 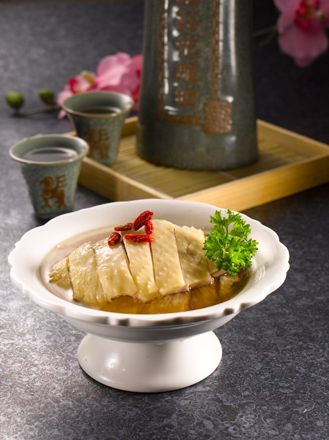 The filling is a skillfully-balanced mix of minced pork shank, ginger and natural pork skin gelatin, which after steaming, melts into a tasty, delicious soup. To eat it, lift the dumpling gently and place it on a spoon, then pinch small a hole at the base. Carefully sip the hot melted soup before consuming the dumpling with the shredded ginger and Chinese black vinegar condiment it is served with for that perfect gourmet taste. 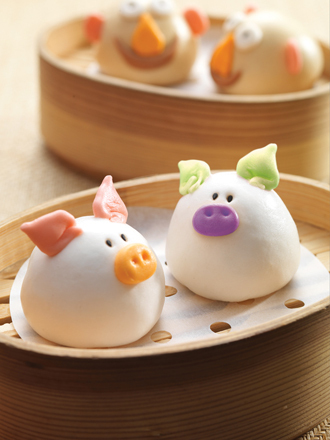 This cute little piggy is filled with red bean paste and lotus paste. Soft and tasty, it is a choice of dessert by both kids and adults.